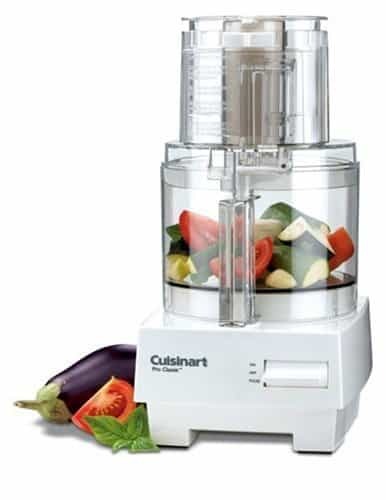 Cuisinart DLC-10S - why is it a top rated food processor? Well, we have a pretty interesting task ahead of us, don’t we? We’re dead set on uncovering the reasons behind the good ratings for Cuisinart DLC-10S food processor. I thought long and hard on how to do that and it came to me one evening while I was sitting in front of my computer and p0retending to write something J I’ll just do a review of this food processor and see what makes it so great to earn such high grades and position. It’s the best way in my opinion to find out anything you want to know about a certain product. Just do a simple review based on your own experience with the product and those of users all around the world. I’ve been testing this little guy pretty hard, so I can offer my own professional opinion on the matter as well. I’m just kidding; I’ll spill the beans right away and do the official review afterwards. I know how much you hate when I prolong giving you the answer (a bunch of you have already told me that, thank you very much), so I’ll try to meet your demands and give you the answer first and then approach to reviewing this bad boy. Because it offers great quality for relatively low amount of cash. Don’t get me wrong, this is not the best food processor in the world, but for the cash you’ll need to dish out to get it, it’s reigning supreme. That was always my number one factor about every product I’ve ever reviewed in my life. The most important thing for me is the ratio between the price and the performance and utility provided. It’s easy to provide you with an excellent product if I’m going to charge you a couple grand for it. On the other hand, if I’m charging it around 100 bucks, I need to be a freaking magician to make everything come together nicely and dish out a satisfactory level of performance. So, I’m really glad now I took upon myself to review this little guy and answer the question that seems to be puzzling a lot of you lately. It’s all about low price and good quality. It’s not easy to get it done, but if you do the customers will know how to appreciate what you have done for them. This food processor put a large dent in the myth that you have to give thousands of dollars if you want to own a good food processor. It’s definitely a step in the right direction towards food processors becoming used more widely than they are today. People love food processors. The only thing they don’t like about them is the price. Once we manage to get the pricing in check, more and more people will embrace them as an essential part of their kitchens. There are a lot of good sides to this food processor that customers liked. We’ll start with the fact that its chopping actions are on the money. It’ll chop the hell out of those onions, grind that Parmesan cheese, mince parsley, slice whatever you need it to, and knead dough. The list goes on and on. The only thing it has some hardships with is the mozzarella. It’s very quiet while doing the work and all of the parts are removable and can be washed in your dishwasher. Customer service is excellent. On the other hand, customers complained to the fact that it features only one operating speed. I hope I answered the question you asked me. I even took your advice and answered it before my short review so extra points for me there. I also hope this article was useful and helpful to you and that it might guide you to your new favorite kitchen appliance.